← The best oil for cooking: Coconut Oil. Step 1: Start with a nice and clean, flat cutting surface. I use a plastic cutting mat, specifically for fish. Also necessary is a good fillet knife. The best fillet knife for the job is not only sharp, but flexible. Step 2: Make a vertical cut in the bluegill just behind the pectoral fin and gill flap, from top to bottom, almost half way through the fish. Step 3: With the top of the fish facing you, start at the first incision, and using the tip of the fillet knife, cut along the spine toward the tail. The tip of the knife will be at the depth it will hit the rib cage. Once the knife is past the rib cage, insert the knife all the way through to the bottom of the fish, and keep cutting toward the tail, while keeping the knife as close to the spine as possible. Stop before you reach the tail, leaving the end attached. Step 4: Now, back where the rib cage is still attached to the fillet, pull up on the meat where the cut is, and start cutting the meat back with your fillet knife. About half way past the ribs is a line of small bones which you should cut through. This will preserve a lot of meat on the ribs and down toward the belly. Once past the ribs, cut the fillet free from the head-end of the fish, and flay it open. Step 5: With the bluegill flayed open, and using the fillet knife, start at the tail-end of the fillet and cut the meat from the skin/scales. Step 6: Now that the fillet is cut from the bluegill, cut the small row of bones from the middle of the fillet. Step 8: Flip the bluegill over and repeat on the other side. These have been 8 steps how to fillet bluegill. 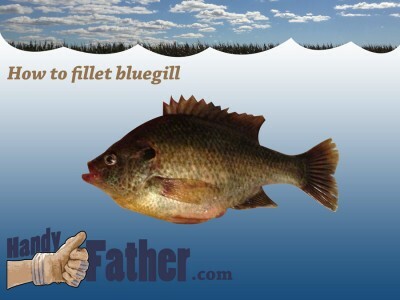 Don’t forget them, because you can come to my house anytime for a meal of fish, but if you can master how to fillet bluegill yourself, I’ll have fed you for a lifetime! Do it differently? Leave me a comment, or tweet @handyfather.